Line from the film: "It looks like its intestines have been sucked out"
Legend of the Chupacabra, a found footage / mockumentary directed by Joe Castro, is an ultra-low budget monster movie that, in spite of its flaws, manages to conjure up a few genuine scares. Three cryptozoologist students head to Texas in the hopes of capturing footage of the legendary Chupacabra, a carnivorous beast from south of the border that, according to some, has been feasting on the local livestock population. One of the students, Maria Esperenza (Katsy Joiner), has a more personal reason for wanting to track down the Chupacabra (it supposedly murdered her uncle a week before), and with heavily-armed former U.S. Marine George Armistad (Stan McKinney) backing them up, the trio heads to the farm of Daniel Webster (Chris Doughton), whose goat was killed the night before (FYI - Chupacabra is Spanish for “goat sucker”). It’s here that their terrifying adventure begins. Despite its mockumentary approach (the movie also features talking-head interviews with several “experts”, all discussing their theories on where the monster comes from), there isn’t a single moment in Legend of the Chupacabra that we believe what we’re watching really happened. Part of the reason for this is the quality of the performances, which, across the board, are on the weak side. But more than that, the creature itself, played by a guy in a suit, looks like.. well, like a guy in a suit! In addition, the story gets a bit goofy from time to time, introducing not one but three religious mediums who insist the Chupacabra is a demon sent from hell. Where Legend of the Chupacabra excels is in the way it handles its monster; unlike other films of this ilk, the Chupacabra appears early and often, usually popping up unexpectedly (resulting in some effective jump scares). Toss in special effects ranging from mediocre (a few of the dead corpses Maria and company encounter are so-so) to pretty damn impressive (there’s a late effect involving a severed arm that looked great) and you have a horror movie that occasionally delivers the goods. 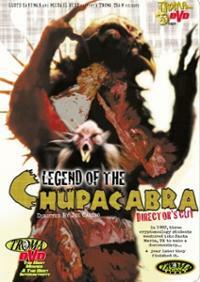 Legend of the Chupacabra may not be perfect, but it’[s not a total washout, either. Fascinated that the review seems to treat the film as a straight forward but low-budget horror film, and really doesn't dwell on its comedic aspects. Well, I'm assuming there are some comedic aspects because the trailer seems to start as a blatant parody of THE BLAIR WITCH PROJECT. If that's what the initial inspiration was, I'm wondering if director Joe Castro changed his comedy concept to include more genuine horror moments. Or, if they were in there from the beginning, like SHAUN OF THE DEAD, offering both laughs and scares, too. Of course, the comparison between the two films is just about the mixture of comedy and horror, but judging from the trailer, CHUPACABRA is definitely a lower budgeted effort and with much less experienced actors. But, your description of the creature itself seems to underline the idea that this film was meant as a comedy, but the fact that it's not featured in the trailer perhaps shows Castor's desire to have his comedy cake and eat it screaming (uh... that perhaps didn't translate too well...). Meanwhile, yet another awesome review and film selection! BONUS: Watching the trailer, it was jarring to suddenly see a naked fat guy mooning us as he goes streaking down a city street as part of a Troma plug (the film's distributor) ends the trailer.